We open with a flashback from the future, where Tim drake as Batman is hunting down the vigilante Anarchy, and kills him. He then runs from the GCPD. It's when he returns to the Batcave that gets abducted by Mr Oz and transported to the prison which houses him, his younger self as Robin and Doomsday. We cut to the present as both Tim Drakes flee for their lives from a rampaging Doomsday. The two Tim's banter back and forth, as the older tells his younger self that no matter what he tries, he will become Batman, the future is set, and he will become the killer that he is. They manage to distract Doomsday long enough to escape back to the current day Gotham City. The older Tim tells his younger self to not push away all his friends as he gets older, especially Conner. Young Tim asks, "Who's Conner? ", when the older version learns that time is not set in stone anymore and he can change the future, his future. He stuns his younger self, and heads off to take care of the one person he blames for his turn to the dark side. "I need to kill Batwoman". Story - 5: This issue could have easily been a filler and slug-fest, but it's a wonderful chapter in this story as it is the first mention since 'Rebirth' began of Conner Kent/Superboy. To any of our newer readers who aren't familiar with Conner, he was the teenage Superboy that preceded Jon Kent. Sadly his origin and back story was "messed up" a little during the New 52 era, and he was wiped from continuity completely since the beginning of 'Rebirth', but I'm sure as hell hoping that he makes a triumphant return soon. I loved the way that Robin/Tim has no clue as to who Conner is, which ties us up with the upcoming "Doomsday Clock" story-line due out soon. Someone (I think we can all guess who) has tampered with time, and made everybody forget certain heroes in the DCU. So far that consists of the JSA, Conner Kent Superboy, Bart Allen Impulse/Kid Flash and Cassy Sandsmark Wonder Girl from the top of my head. Kudos to James Tynion IV for crafting a tale that gives you a peek down the proverbial rabbit hole, and leaves you wanting more. With the reaction that Batman/Tim had toward young Tim not knowing about Conner, and him finding out that the future is not set, made me really feel for the older Tim, who actually despises what he has become. In the last issue I mentioned that this is similar to the Tim Drake Batman from the Geoff Johns "Teen Titans" future Robin (I almost confused myself there), now I am wondering if this is actually that very version of Tim. I love the continuity call backs. Which begs the question, the Superman in the flashback scene that calls Tim, is it Clark or Conner? He does state, "The Titans need their Batman". Lastly Tynion IV showed us how each possible Robin met his end. I found it rather poetic that Tim may have actually killed Damien to claim the Batman mantle from him. Wasn't too impressed with what happened to Jason Todd, but that's a minor nitpick. Really loving this arc right now, looking forward to the next issue. Congratulations DC you have done well. Art - 5: So much awesomeness in the art of this book, it's going to be hard to put in words. From the different Batmobiles in the Batcave to the flashback scenes of how the Bat Family fell, the detail by Barrows is amazing. Firstly let me mention, we see an awesome shot of Superman, via a holographic projection by Batman/Tim. Ed Barrows has the current Superman costume locked down, the belt looked great, something that a lot of artists are finding difficult to pull off. Secondly his Doomsday has a genuine frightening quality to him. The sharp boney exterior and the larger size made for great suspense as both versions of Tim ran for their lives. Many comic artists use this technique, but the almost storyboard-like panels in some scenes give you that cinematic feel that we are used to seeing in live action and animation. I literally can't wait for the next issue. Barrows is fantastic, he and James Tynion IV make a great duo for story telling. Lastly let me mention both Eber Ferreira for his inks and Adriano Lucas on colors. They added so much to the visuals, it would be a crime not to acknowledge their contributions. The inks aren't too heavy and the colors are right on par in setting the tone. 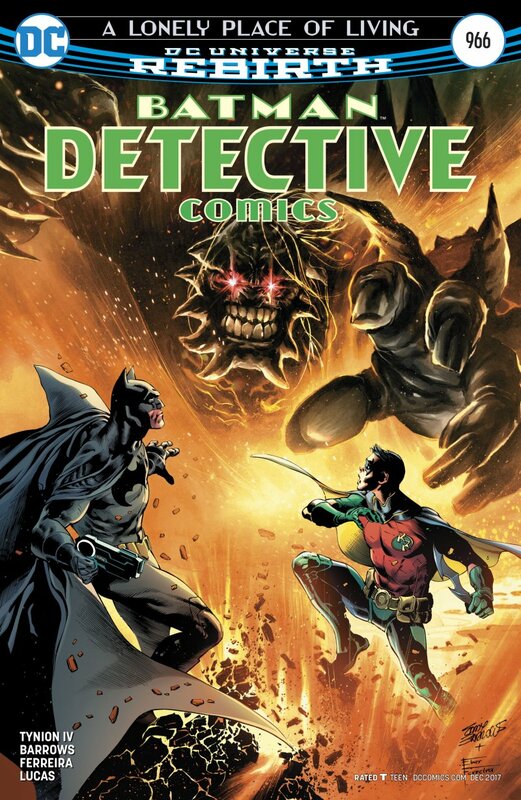 Cover Art - 5: I like the main cover by Barrows more than the variant. I think having Doomsday come for Batman and Robin is more impactful than watching Batman holding two guns.